We work closely with our clients from start to finish. We incorporate your ideas into our design processes at every step of the way. Our video technology means you can take an online tour of your garden to see if you like it before we’ve even started the work. We all know that weeds can make your life as a gardener a misery. But not everyone knows this simple solution: Cram your garden full of evergreens! Just by leaving so little soil exposed, the chances of a weed invasion are pretty minimal. And the layering of different greens looks fantastic. 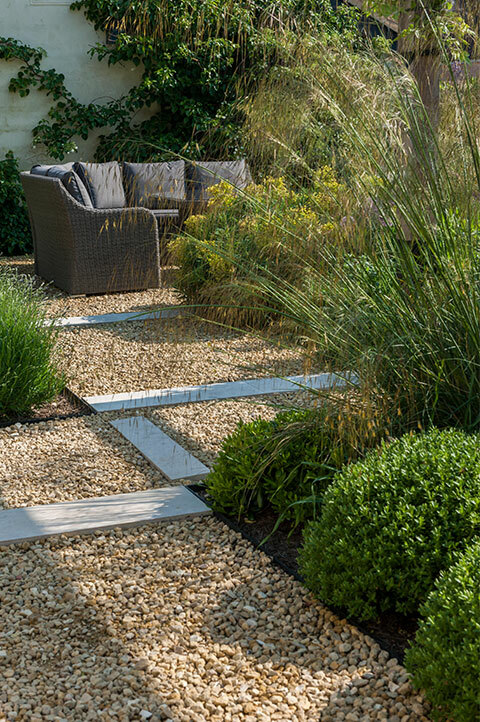 We often plump for lots of block planting in our designs, here is a low-maintenance approach to medium size garden design. In fact, all you’d need to do in the garden pictured is a little pruning from time to time. Medium gardens in London can sometimes feel a little cramped. 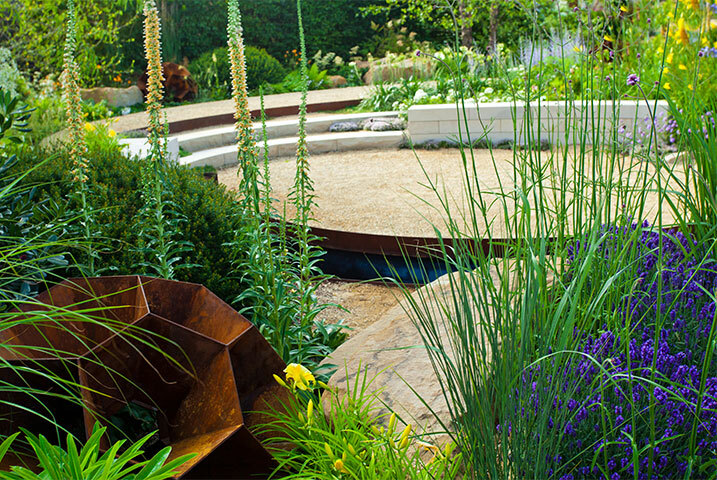 But with a clever use of curving lines – usually in modern gardens designs – contrasting levels, and diverse planting, we can visually open up the space. 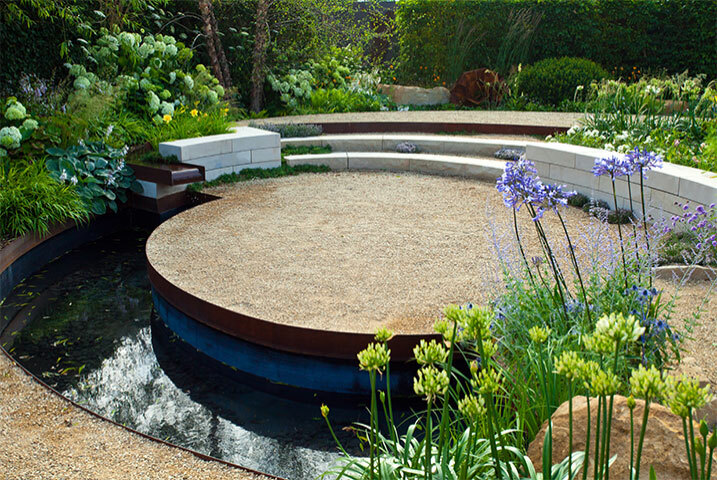 Here, a central circular seating area has been surrounded with a semicircular moat. And also introducing additional height differences via the wall and the steps. The light colour scheme and open space in the centre makes it seem larger than it is. 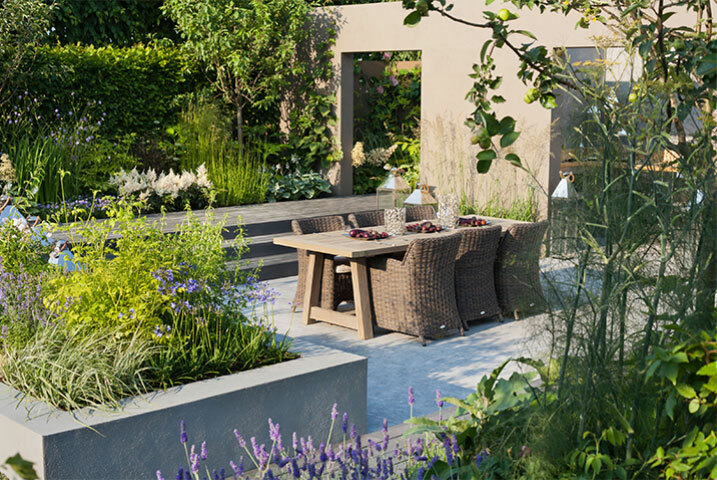 With its profusion of beautiful colour and life, this medium garden design looks absolutely amazing. But it also looks like it needs a lot of upkeep. However, you would be surprised to know that many of the plants actually take care of themselves. 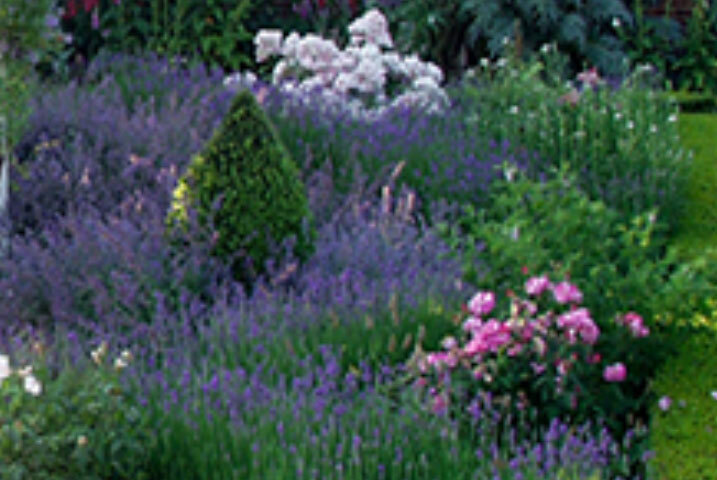 The right selection of lush evergreens, grasses, and perennials can provide year-round visual interest without you so much as lifting a finger. And a smart watering system can take care of the rest of the work, which leaves the garden to be simply enjoyed. When you’ve already got plenty of room, there’s no need for the illusion of space. Instead, we recommend that you avoid clutter. 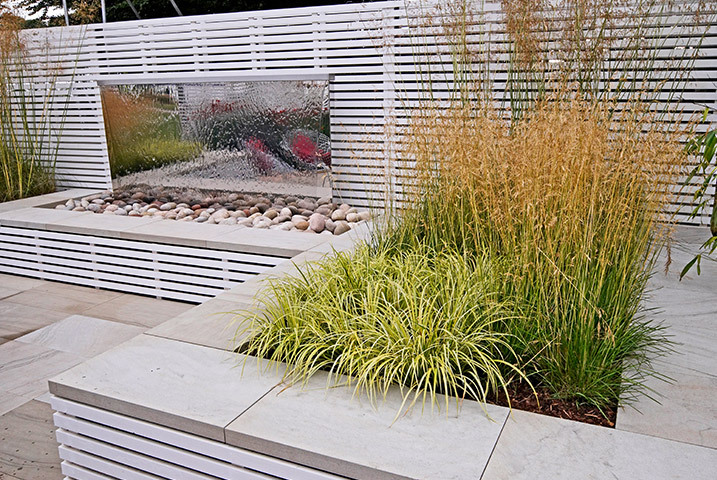 In this medium garden, we’ve gone for a wonderful white slatted dividing wall with a large design mirrored water feature. 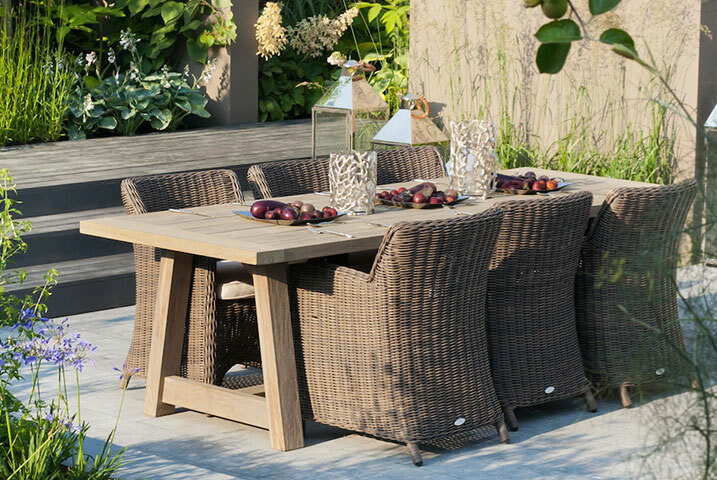 Raised borders with copping stone provide ample seating for up to 30 guests without needlessly taking up precious space. 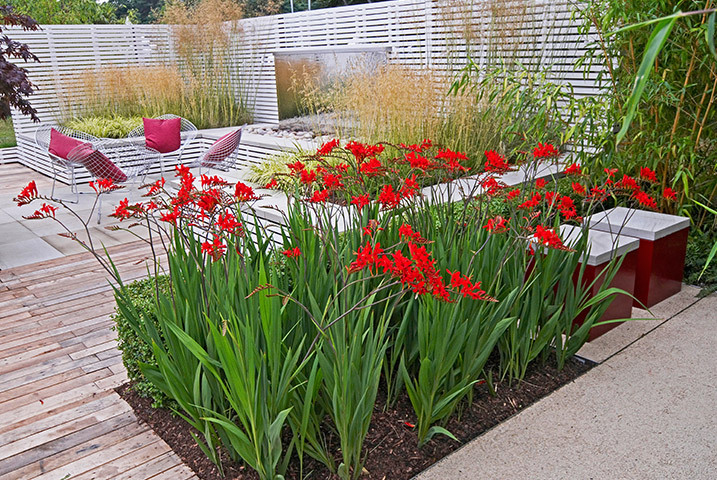 And the feathery planting choices are at once both modern and minimalist, which complement the uncluttered colour scheme. 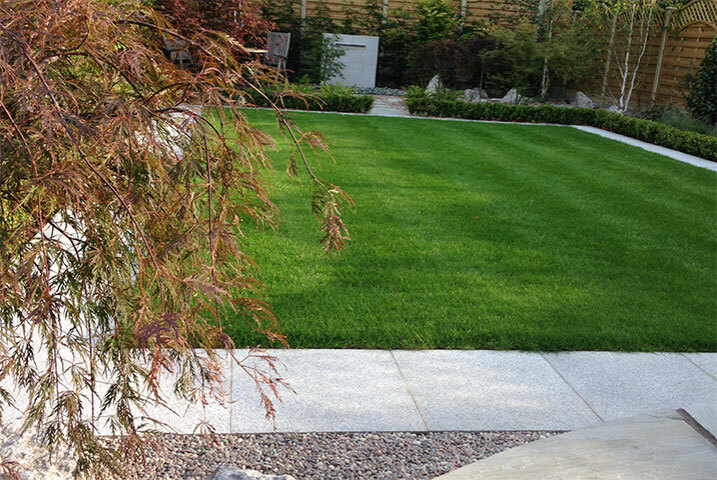 Medium size gardens are a great blank canvas to work with. 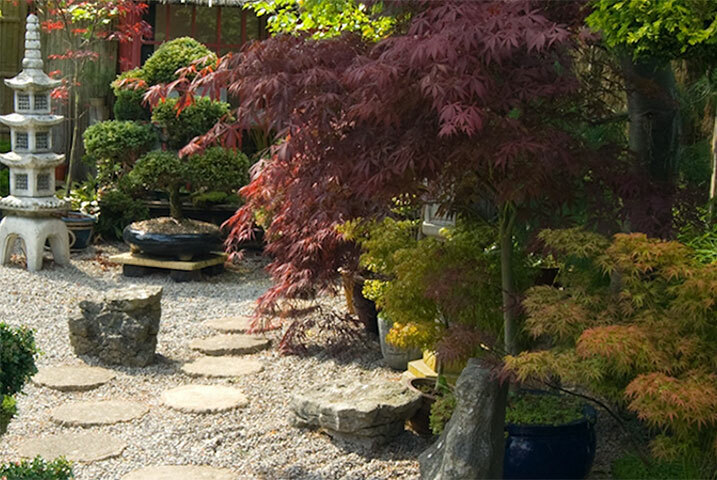 In this beautiful Japanese garden, there’s plenty for the eye to take in. The design’s potential has been off set to overwhelm you with the striking circular feature. This serves to concentrate the gaze on wherever we want it to settle. Needless to say, Japanese style gardens like this tend to be higher maintenance than other styles. The gravel garden alone could get messy without a Zen monk to rake it. But it is fantastic design, for those of you who take pleasure in these tasks. 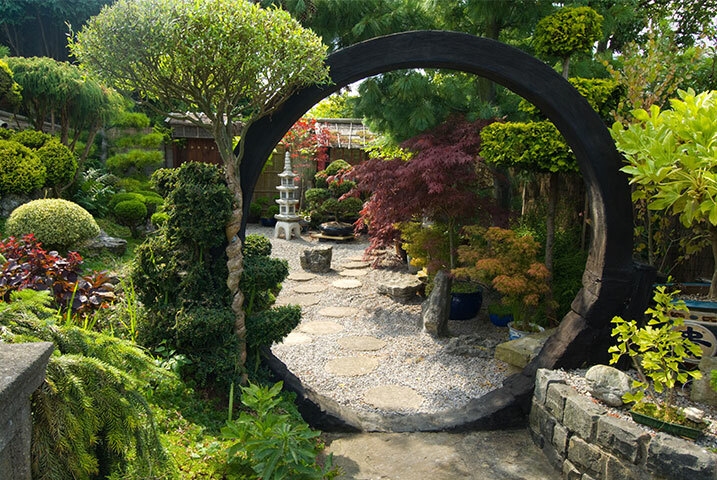 In this medium garden design, a circular portal to frame key features has been used to help direct the gaze. In this case, it’s the water feature. The dynamism and life of these water spouts are a crucial element of the design. 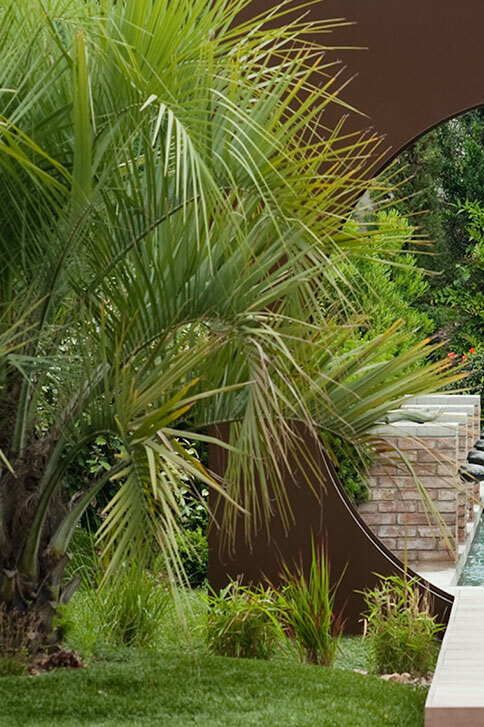 Hence the walkway and palm fronds are also intended to frame them, while in the background dense greenery draws us in. Meanwhile, the modernist classical bust elevates the overall theme with a dynamism and life of its own. 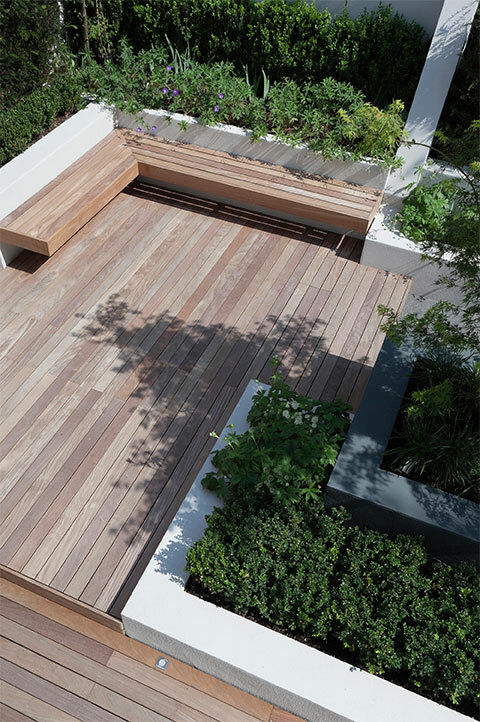 The use of wood in London garden designs creates a wonderful contrast to the city. 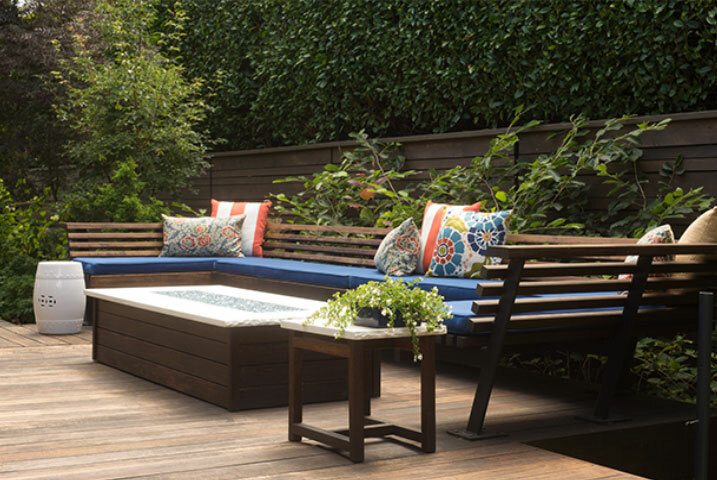 We think wood is also a softer, more soothing option than stone paving and block work. Not only does it look more alive, with its natural fibres and grain; it also feels different to walk on, which adds a different dimension. As in the picture, wood can be dark in colour. But this only makes the greens look more alive. And you can offset the darkness with bright styling choices of your own. You’ve heard of bringing the outdoors in. Here we’ve brought the indoors out. 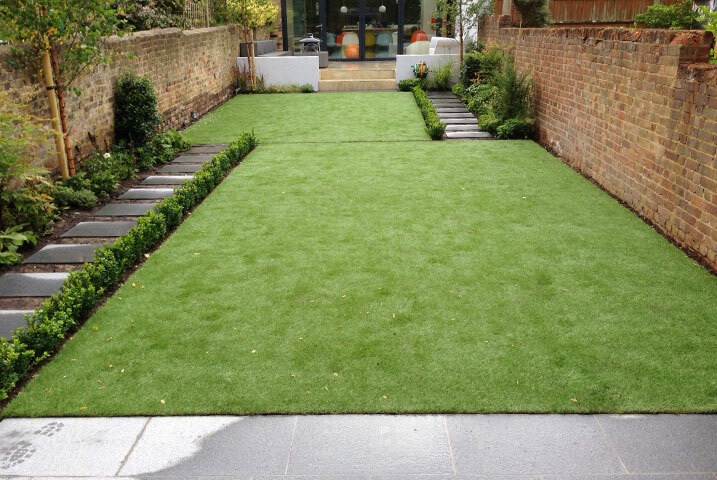 This medium garden design prioritises hard landscaping with the impression of rooms in a house. We go for this approach, using a piece of modern art, to draw people into the space. 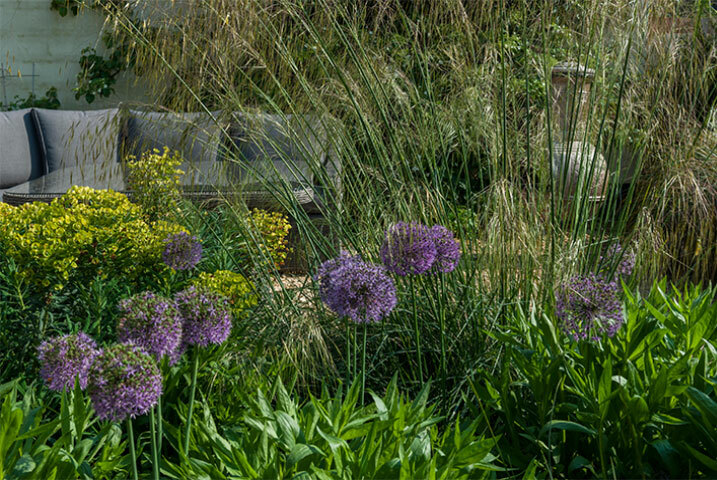 Our planting choices are deliberately feathery, as well as subtly coloured, so as not to detract from the design. And the comfortable wicker seating adds to the homely appeal. Speaking of furniture, it’s important to consider size and use. 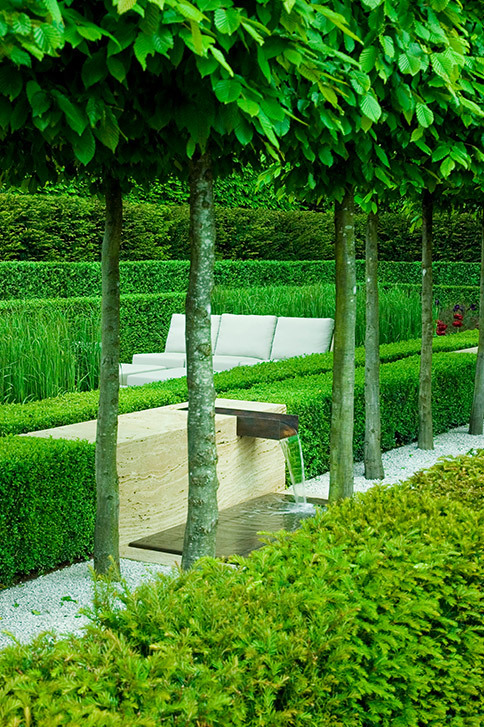 Clutter is the enemy of medium garden design. So the last thing you want is a huge table and bulky chairs taking up space on the lawn. That’s not to say furniture is a bad thing, though. 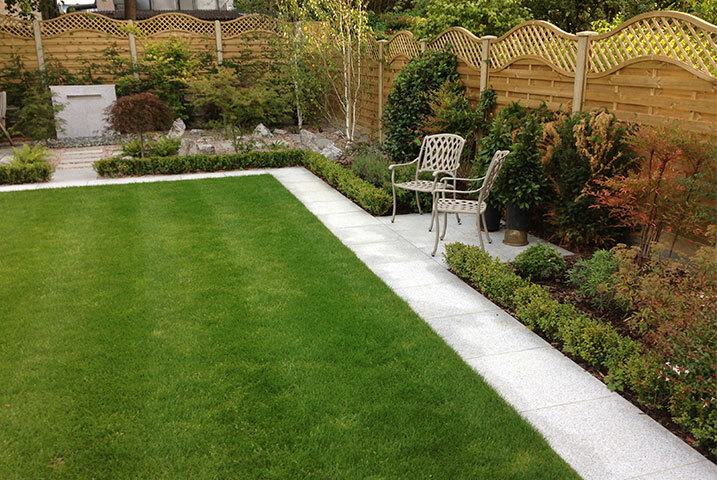 In this picture, the two chairs beside the path complement the trellised fencing and create a more welcoming feel. Crucially, however, their light colour camouflages them against the path and they don’t clutter up the design. 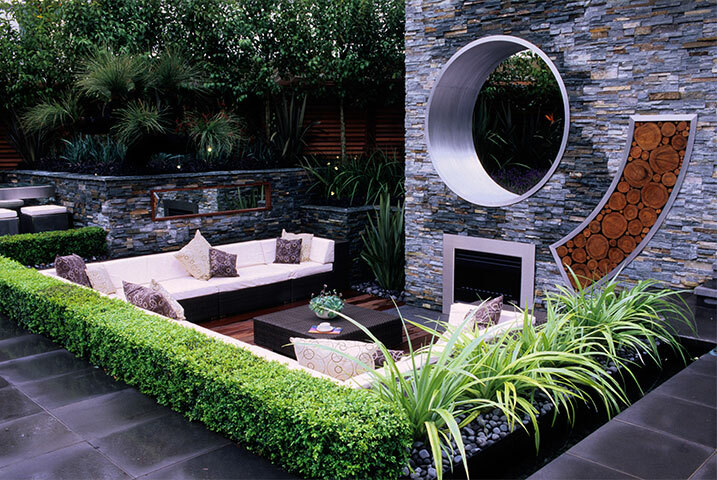 Medium garden ideas should be sensitive to the constraints of the space. 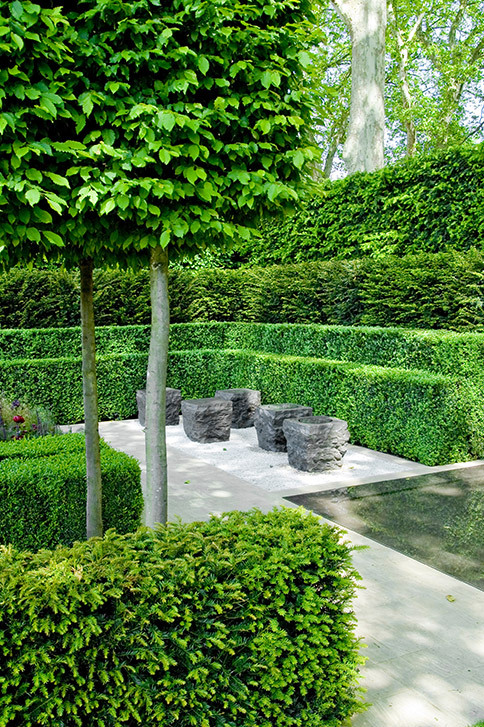 This garden has a rather limiting, narrow shape. By laying the lawns and stepping stone pathways as we have here, we’ve visually expanded the width. However, we also achieved an overall symmetry. 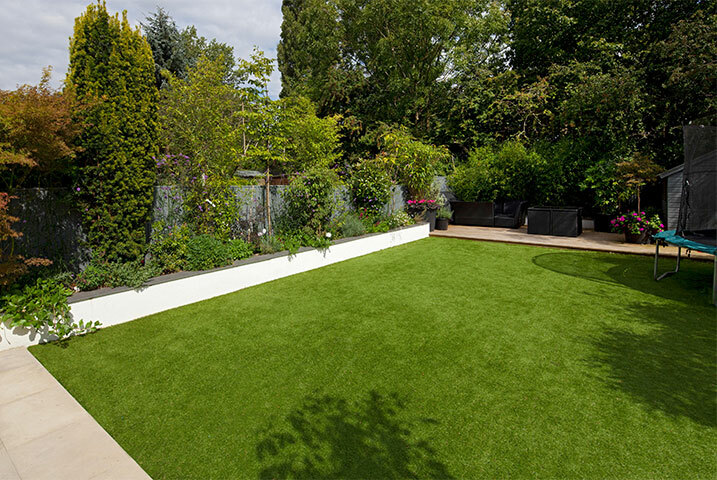 As a family garden, it was also desirable to incorporate compact, well-defined play areas. Meanwhile, on the terrace, there’s ample room for barbecues and birthday get-togethers. 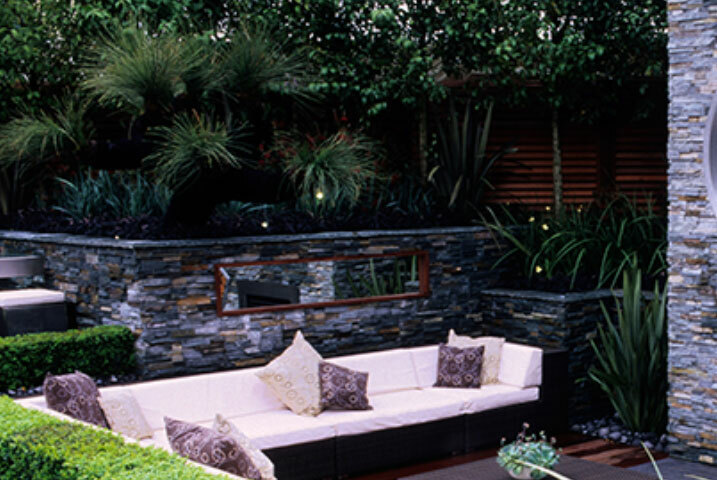 This is another one of those medium garden designs that prioritises hard landscaping elements. It’s clearly a garden for entertaining. 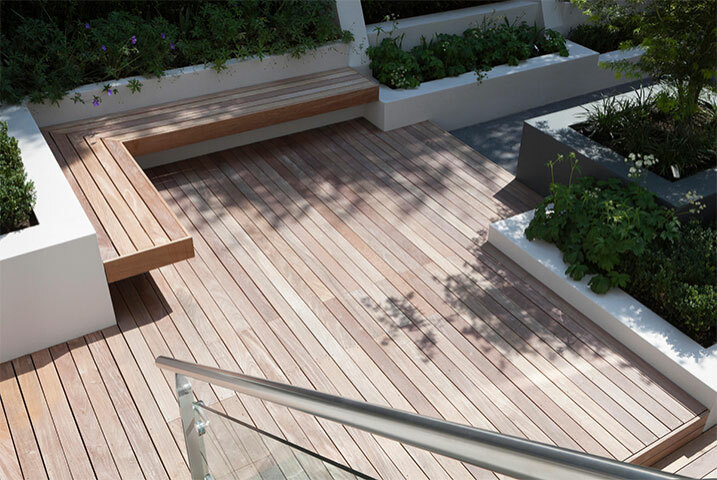 And this kind of decking is nice and easy to maintain. But there’s more going on here than it seems. The angular geometry directs the gaze to the numerous corners as focal points. However, the gaze doesn’t stay there long. The styling is intentionally sparse to encourage movement around the space. 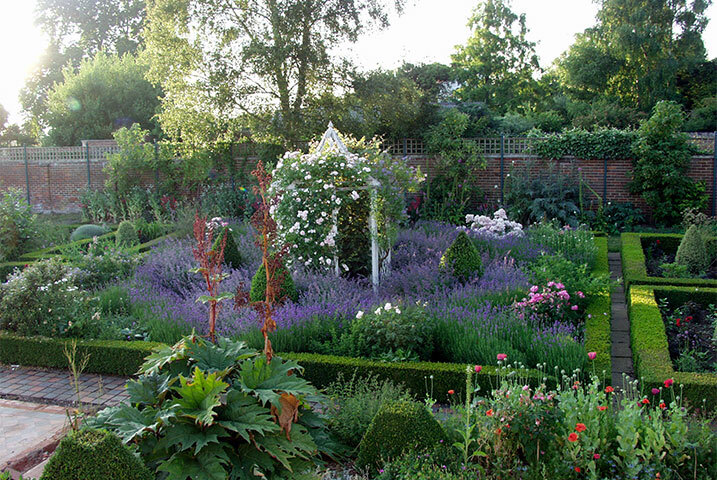 Here’s another example of visually opening up a long, narrow garden. We call the paving stones used here eye breakers because they effectively break up the gaze. They prevent the eye from taking in the garden at a glance, which would ultimately make it seem smaller. We also wanted them to encourage the eye to travel laterally rather than up and down. We chose feathery plants—as opposed to denser shrubs—to keep it from feeling too cluttered. With this design it’s great to use the same materials as what you would use in your house to complement both spaces. 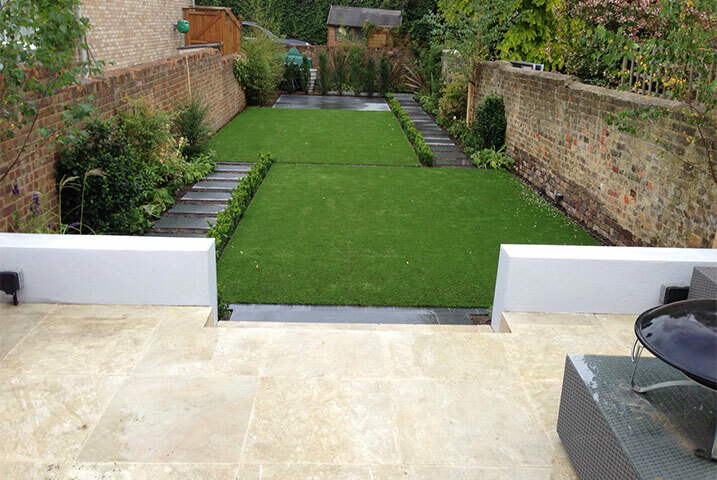 When paving medium size gardens, we usually find that a neutral grey colour is the optimal shade. Lighter colours, such as buff, can be overpowering. The same is often true of a textured finish. We introduce texture with stone walls instead. Meanwhile, we often go for block planting and grasses allow the grey to really pop—and vice versa. We love white walls. They have been on-trend for medium sized London gardens for the last six years or so. It’s easy to see why; they’re bright, they visually open up the space, and you can do it yourself within minutes. 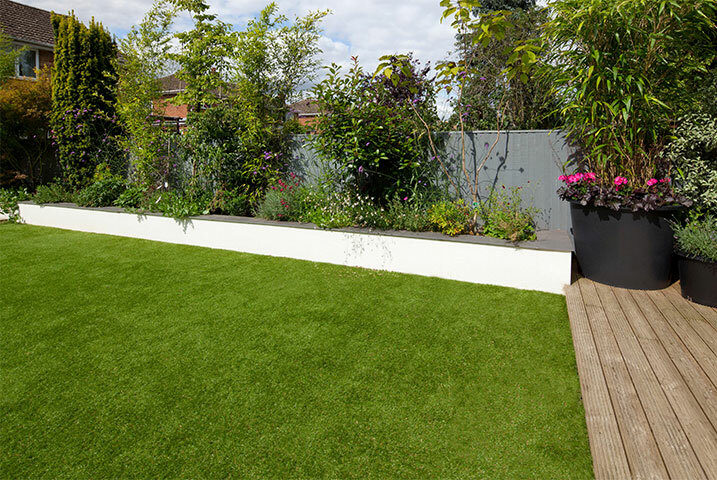 In this garden, the white wall contains a raised border. These have become popular too, allowing for dense planting and manageable upkeep. After all, not having to bend down to look after your plants tends to make gardening more enjoyable.